As the tides were flowing – Taught to us by The Witchmen Border side and written and choreographed by a member of the side, Terry Dix, this was his first ‘self penned dance. Bob’s Bike – Music and choreography by members of the side (Please seek permission before use). 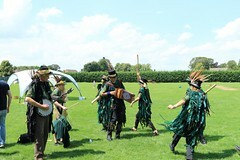 Morris dancing is a living and changing tradition. Each side has their own character and will dance in their own unique way. Sometimes that may be common enough to another side to allow members of that side to join in and sometimes it can go horribly wrong, although it is always good fun. Some of the dances above were collected and recorded in the early 20th Century and so the origins are lost. 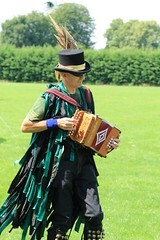 However at the time border morris was regarded with some disdain and so not many dances were collected. This means that many border sides have created their own dances. The list above includes some of the collected dances and some from other sides for which we thank them very much. 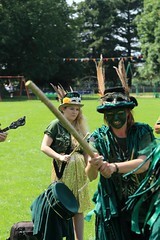 In time we will have even ore of our own dances to add to the tradition.